New book, some shelf wear to jacket, 384 pages. 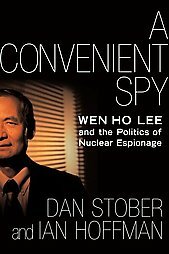 This book examines the Wen Ho Lee espionage case, an astonishingly inept investigation of a crime that may never have taken place, ending in a national disgrace. After being indicted on 59 counts of stealing America's nuclear secrets, he was released with an unusual and emotional apology from a federal judge. In this stormy confluence of intelligence and politics, Lee became a convenient spy, but was he guilty?